Salt and fresh waters are very different from each other on their optical properties. Optically pure off-shore oceanic water absorbs shiefly red rays and transmits blue rays. Therefore, oceans and open seas have typical blue color (similar to blue sky). Inland seas are more turbid and have bluish colors with the transition to greenish ones. Due to suspended particles fresh waters are much more turbid than in inland seas. In general, turbid fresh water absorbs chiefly blue rays and transmits red rays. Depending on the properties of suspended particles, fresh waters have greenish, yellowish or even brownish (in peat bogs) colors. Only optically pure fresh water in mountain lakes and drawn quarries is blue. These differences in the optical mediums are reflected in the spectral sensitivity of eyes in saltwater and freshwater fish. Spectral sensitivity is an ability of the eye to perceive monochromatic light of equal power with the different wavelengths. Eyes of saltwater fish, and human, are most sensitive to light with the wavelengths of 550-560 nm (the green-yellow part of the spectrum) (the left curve in the Fig.1). Reflecting optical properties of the freshwater medium, eyes of freshwater fish are more sensitive to light with the wavelengths of 600-680 nm (the red part of the spectrum) (the right curve in the Fig.1). Due to bell like dependence of spectral sensitivity equipower monochromatic light of different wavelengths are not equally bright to the eye. Green light is most bright for human and saltwter fish, red light is most bright for freshwater fish contrary to our perception. For example, the maximum of spectral sensitivity in freshwater adapted threespined stickleback, Gasterosteus aculeatus, is near 605 nm (e.g., Rowe et al., 2004). 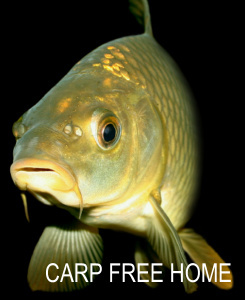 In common carp, Cyprinus carpio, goldfish, Carassius auratus, and bluegill, Lepomis macrochirus, these maximums lie in the region of 612-615 nm (Cronly-Dillon & Muntz, 1965; Tamura & Niwa, 1967). Grundfest (1932) gives the same results for other Lepomis. In L. macrochirus, this maximum can be shifted to 620-640 nm (Hawryshyn et al., 1988). The maximum of spectral sensitivity in largemouth bass, Micropterus salmoides, which are the natural predators for the foregoing Lepomis, is shifted even to 673 nm (Kawamura & Kishimoto, 2002). According to Matsumoto & Kawamura (2005), eyes of common carp and Nile tilapia, Oreochromis niloticus, are sensitive to light in the near-infrared part of the spectrum. In anadromous Far-Eastern redfin, Tribolodon hakonensis, the maximum of spectral sensitivity is shifted from 548 nm, in lake, to 612 nm, in more turbid pond (Kawamura & Kishimoto, 2002). These features of spectral sensitivity in fish must be taken into consideration in naturalistic, scientific, applied and other research. Color vision of human is closer to that in saltwater fish. On the other hand, color vision in freshwater fish and other freshwater animals, like tadpoles, is far different than ours.